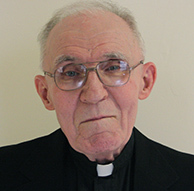 Father John Joseph Travers, C.Ss.R., died on June 23, 2016, at the Neumann Residence, a health-care facility in Timonium, Md., surrounded by his Redemptorist confreres and the residence staff. He was 82. He was the son of the late Henry Travers of Finadoos County, Donegal, Ireland, a maintenance worker at Harvard Medical School, and the late Mary Josephine Donnelly of Barna County, Galway, Ireland, a registered nurse at New England Hospital for Women and Children. He leaves his older sister, Margaret, a missionary in Japan, his brother Thomas, also a Redemptorist priest, and a younger brother, Henry, and his wife, Elizabeth, of Foxborough, Mass., and their children, Marie and husband John Perry and Tom and wife Nicole Travers. He was pre-deceased by his uncles Michael Donnelly of Mission Hill and Larry Travers of Lynn, Mass., and aunts Rose and Agnes of Dorchester, Mass. He was born in Boston on April 3, 1934. He attended Mission Grammar School, where he sang in the choir and played the violin in the orchestra. At this time he developed his love for the Boston sports teams, especially the Boston Braves. He kept their statistics in copybooks, and once he proudly received a letter from a Boston sportswriter praising him for his voluminous knowledge of the members of that team. When he graduated, he entered the Redemptorist Minor Seminary at North East, Pa. Later he went to the Redemptorist Novitiate in Ilchester, Md., where he professed his vows as a Redemptorist on August 2, 1954. He was ordained a priest on June 21, 1959, at Mount St. Alphonsus, the Redemptorist Major Seminary. Upon graduation he was sent to the Angelicum, a Dominican College in Rome, Italy, where he earned a degree in canon law. When he returned to the United States, he was assigned as assistant pastor at St Mary’s in Annapolis, Md., and later at St Anthony’s in Lancaster, Pa. In 1975 he was assigned to Perpetual Help Parish in Edgewater, Md., and made pastor. He stayed there for 12 years during a time of great expansion. Together with a very active parish council, he began work on a new parish complex in 1977. It was dedicated on Easter Sunday, 1980. From there he was assigned as pastor to Our Lady of Lourdes Parish in New Holland, Pa. He later went to Perpetual Help Parish in Brooklyn, where he was assigned the Wednesday novena devotions in honor of Our Mother of Perpetual Help and the RCIA program for prospective Catholics. Father Travers was famous for his storytelling preaching style and for teaming with other members of the community for their successful RCIA program. His knowledge of computers, the Boston sports teams, and electronics was legendary, and his devotion to Perpetual Help was his constant support. Father John Joseph Travers, C.Ss.R.